Is Including Fiber in Your Diet Good for Weight Loss? Making one change to your diet by adding more fiber can be as good for weight loss as a more complicated change of both diet and exercise. According to the results published in the Annals of Internal Medicine, the University of Massachusetts Medical School used 240 volunteers in a study separated into two groups. All of the volunteers had metabolic syndrome at the beginning of the research meaning they had high blood pressure, high blood sugar, high cholesterol and were overweight. Group One followed the American Heart Association’s recommendations of eating more fruits, vegetables, high-fiber foods, fish and lean protein in their diet, while cutting back on salt, sugar, fat and alcohol. Group Two’s only change was to add fiber to their diet. As far as fiber, each group ate about 19 grams daily. Exercise was not added to either group’s recommendation. At the end of the study, both groups lowered their blood pressure, improved their response to insulin and lost weight. Group One lost 5.9 pounds on average while Group Two lost 4.6 pounds. Both groups were able to maintain their weight loss for the 12 months. What is significant about the study results is the weight loss between the two groups was not all that different proving that by just adding fiber to a diet, weight loss is possible without making any other dietary changes. And if weight is lost, it reduces the risk of other health issues such as heart disease, stroke and diabetes – some of which can be life-threatening. While it is possible to add fiber to a diet through fiber-fortified foods like breakfast cereals, cookies and crackers, fiber from whole foods is better (for several reasons). Use a goal of 20 to 25 grams of fiber per day. 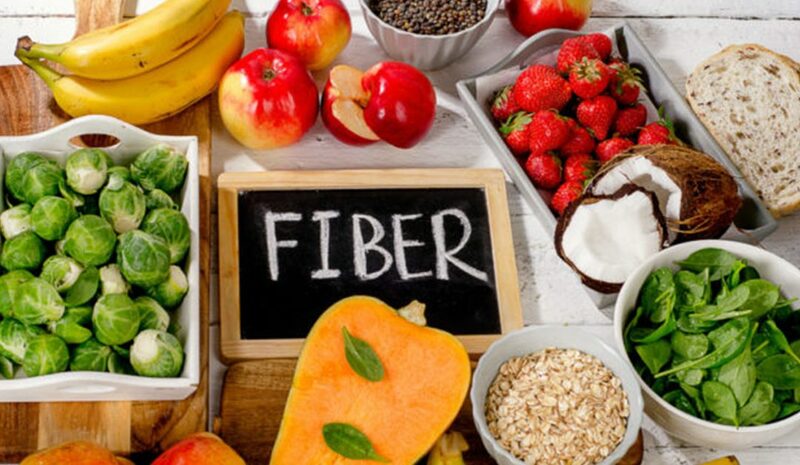 Because fiber can cause bloating and gas, increase your daily fiber content gradually, thus giving your body some time to adjust to the increase of fiber. Good sources of natural fiber include beans and lentils, whole grains, seeds and nuts, and fruits and vegetables. Beans and lentils are particularly beneficial as they are not only a good source of fiber, but also lower blood pressure, cholesterol and blood sugar. Adding fiber to your diet from the above sources is also a great start to a healthy diet. By eating fiber-rich foods, you will stay fuller longer, thus reducing your desire to snack on unhealthy foods between meals, and you’ll reduce your intake of refined grains, salt, sugar and saturated fats and increase unsaturated fats – all of which work toward improving your health.